Established in 2016, The Brickyard is a professional audio recording studio in Alpharetta, GA built for musicians by musicians. Our 2000 square foot facility provides a comfortable, inspiring space outside of the city for artists to focus on their music with no distractions. Our engineers, producers, and staff are there to assist in developing and capturing your musical vision with compassion and experience while helping to get the absolute most out of your session. We've created a space where artists can get top quality recordings of their work on an artist's budget. Whether you're a solo artist, band, or full orchestra, Call The Brickyard today to discuss your project. We'll help you form the plan to bring your music to the masses. The Brickyard is a 2000 square foot facility located about 30 minutes north of downtown Atlanta on a private six acre lot in rural north Alpharetta, GA away from the hype of the city. The studio's 300 square foot control room utilizes an analog/digital hybrid system with top notch analog equipment from API, SSL, Neve, Chandler Limited, Universal Audio, and many more. Pro Tools and Logic are our main DAW's, but we can accommodate sessions in any format. Our large 25'x 36' live room is ideal for recording drums or orchestral/band ensembles. We have two smaller isolation booths great for isolating amplifiers or solo instruments, one larger isolation booth that can be used for multiple purposes, and one vocal booth adjacent to the control room that can also be used as an isolation booth for soloists or amplifiers. Our lounge has plenty of room to hang out and relax when you're taking a break from your project. 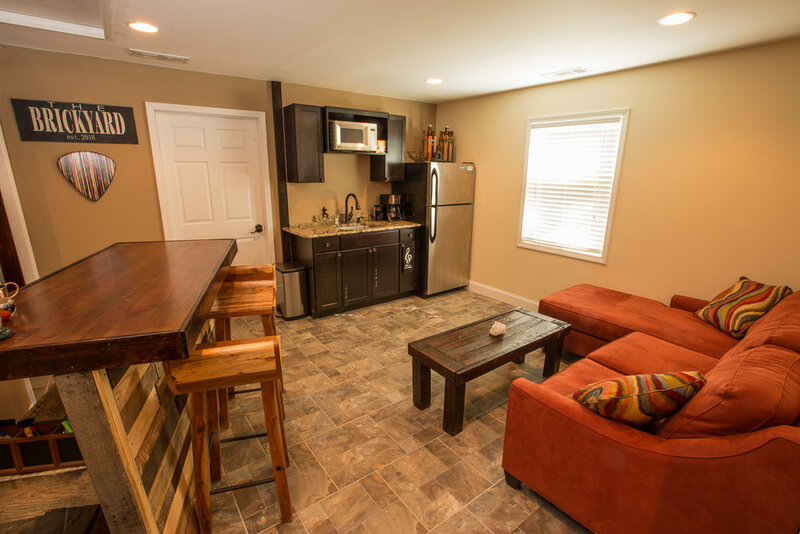 We have a kitchenette, bar, and full bathroom with shower along with our giant back yard with plenty of sunshine. Whether your a solo artist creating your masterpiece, a full band that wants to "live track" your songs, an ensemble wanting to capture a performance, or just wanting to lay down a quick voiceover or audio book, you can make it all happen under one roof at The Brickyard. We also can accommodate bands passing through on tour or prepping for an upcoming show that are looking for a private, furnished room to rehearse or put together some media. All of our top notch equipment can be used to achieve whatever sound you hear in your mind and our engineers will help you bring it to life every step of the way. If you'd like to know more about what equipment we use at The Brickyard click on the button below to view our gear list.